36 v / 72v conversion. Well to those who do not know what I get up to with my C5's ,this is one of them. 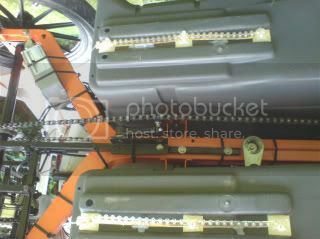 A 36v / 72v hub drive conversion. This version is called 'Turnip' , dont ask why? ..... And yes dave the guts from it are yours bud. But watch out for T2 !!!! 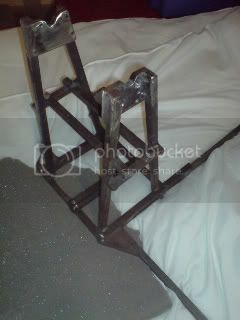 *Chassis sandblasted and strengthened and powder coated. 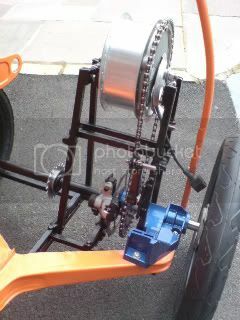 *The Axle due to hollow I had it cut and a new one made of SOLID STAINLESS STEEL ( ouch ) *Front and rear disc brake *Bander chain ( stainless steel with a 320 kg brake allowance ) *36 / 72 volt German hub fitted with a Hope chain ring. *2 x 36volt Lion - Lifpo4 batteries . 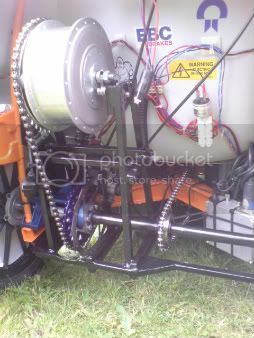 *All new bearings and bearing runners, ( pillar ) *Chain tensioner ,stainless steel throat and press of 6kg to help sag. 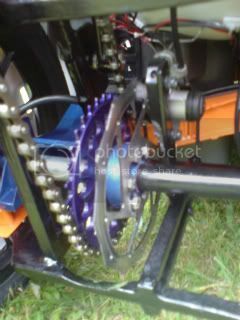 *Hope rear sprocket, 36 click, nice and quiet. 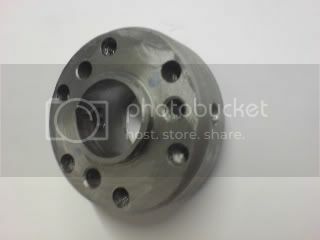 *A 12mm steel housing to hold the hub and strengthen chassis. 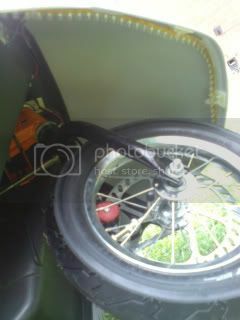 ( I got help with the welding ) *A boss to hold both the drive gear and disc brake. 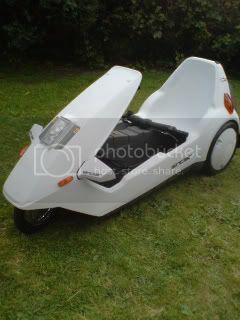 *Strip lights underneath ,Red underside at rear , blue direct under and white around the front wheel. This lights up the front wheel cover reflectors and gives a good visibility. Results: 36 V HT = 18mph up hill + 23 on flat. 36 v HS = 32 mph on flat , Not good up a hill 72 v HS = 48 mph on flat .... gave up as nearly **** myself. 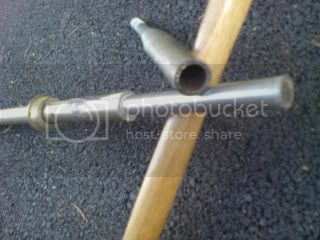 And you bent the axle ? Bad design waiting for the bits to improve if any way happy birthday for yesterday you tart and do I get the front wheel and pod with speedo ? 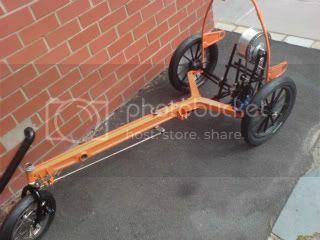 Its geared for that, with your weight dave not mine ..... Only a speed demaon like you would like those speeds bud. When is t2 ready looking forward to seeing that ?